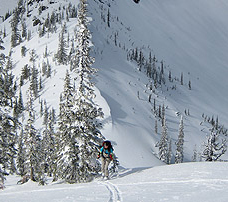 To share any info your have on backcountry skiing in the Coast Mountain, or to get the lowdown from others, check out our backcountry skiing forums on the region. The Coast Mountains are a major mountain range of western North America, stretching from south-western Yukon through the Alaska Panhandle and nearly all along the Coast of British Columbia. The range is home to big-time resorts like Whistler/Blackcomb and includes big mountain backcountry skiing tours like the Garibaldi Neve, Spearheads, Pantheons and BC’s highest mountain at 4,019m (13,190 ft), Mount Waddington. The Coast Range is hammered by Pacific storms which deposit some of the highest levels of precipitation on the continent—yes this means snow. To get an up-to-date forecast for the terrain around Smithers and Terrace, check out the CAA’s Northwest BC Avalanche Report. For a report of conditions in the Whistler backcountry and environs, look at the South Coast Avalanche Forecast. We want to “beef up” the site for next season and are on the lookout for people who can provide route descriptions that aren’t featured here. It’ll mean better, possibly safer, and definitely more fun tours for readers like you. To contribute to the areas we are focusing on currently, just CLICK HERE and let ‘er rip. If you have any questions, contact backcountryskiingcanada’s Grand Poobah. We all want your input and will help you out in any way we can.